As banks — central and otherwise — falter and fail across the globe, it is increasingly obvious that the problems of monetary policy that we face run deeper than merely finding the correct adjustment to a Taylor rule. It is trite but nevertheless true to say that great monetary reforms are necessary. The purpose of this article is not to argue for particular policies, but to examine a particularly important historical example of how (and how not) to go about monetary policy and reform. In the mid-19th century, Britain witnessed a lengthy and heated debate over the limitations to the powers of the Bank of England. Britain had been plagued with economic upheaval during the period 1797–1821, when it had abandoned the gold standard for an inconvertible paper currency. In addition, Britain's return to a convertible currency in 1821 failed to prevent a financial crisis in 1825, a crisis that generated widespread interest in the problems of money and banking. Monetary reform was desperately needed and was discussed widely in practically all circles of society. Over time, two major groups emerged in this dispute that became known as the Currency School and the Banking School. The goal of both camps was to discover the optimal method of limiting (or not limiting) banking practices so as to encourage economic stability. Many treatments of the Currency-Banking dispute focus narrowly on the opinions of key players, neglecting to explain the broader debate and its ultimate relevance for economics. In fact, some treatments of the history of thought ignore the debate altogether. For example, Joseph Schumpeter called it an "ephemeral controversy" ( 1963, p. 725), whereas for economists like Mises and Rothbard, it is a defining moment in the history of economics. 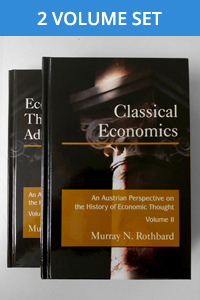 Rothbard takes special pains to weave a historical narrative to help explain this important period in economic history. While both sides of the dispute supported a currency convertible into specie, they differed on the question as to whether it was necessary to impose further restrictions on banks of issue, in addition to convertibility, in order to safeguard the banking system. The Currency School, represented by men such as J.R. McCulloch, George Norman, Samuel Loyd (Lord Overstone), and Colonel Robert Torrens, was largely critical of the policies of the Bank of England, and sought to impose limitations on its ability to increase the supply of bank notes. The Currency School saw, albeit incompletely, that the excessive issue of notes by the Bank of England and its subsidiaries was the cause of the business cycle, and, to a certain extent, Currency supporters anticipated the theory of the cycle that was developed by Mises. The Currency School sought then to impose restrictions on the ability of the Bank of England to issue excessive amounts of notes. The School was guided by what became known as the Currency principle, which stated that "note issues would be correctly regulated if they were made to fluctuate in volume exactly as a purely metallic currency would have done" (Daugherty 1942). Another way of putting it would be to say that "[t]here is always a danger of an over-issue of bank notes, which therefore should be strictly regulated — so regulated that the notes might become mere tokens for metallic money" (Wu  2007, p. 130). As a response to the actions of the Bank of England, the Currency School proposed a simple, yet powerful limitation on the bank: a 100-percent reserve requirement on the issue of new bank notes. The Currency principle was eventually victorious in the legislative realm. In 1844, the Bank Charter Act (commonly called Peel's Act after Sir Robert Peel, a prominent member of the Currency School) was passed. It split the Bank of England into two branches, one branch to issue notes, and the other to handle the deposit business of the bank. The act imposed what was essentially a 100-percent reserve requirement onto the note-issuing department. "As a response to the actions of the Bank of England, the Currency School proposed a simple, yet powerful limitation on the bank: a 100-percent reserve requirement on the issue of new bank notes." However, the Currency School based their reform policy on a serious theoretical error. The Currency School famously argued that, unlike bank notes, demand deposits were not money, and thus were of no importance as far as bank policy and financial crises were concerned. Consequently, Peel's Act completely avoided any regulation whatever of the deposit-banking branch of the Bank of England. The opposing school of thought, the Banking School (led principally by John Fullarton and Thomas Tooke), attacked this distinction between notes and deposits, arguing that both performed the same economic function. Despite being correct on this point, the conclusion of the Banking School was that neither notes nor deposits should be subject to any restriction other than convertibility into specie. Any additional restrictions would hamper the ability of the banks to expand credit to meet an increase in demands of business. The Banking position was summed up in a Banking principle, which states, "The amount of paper notes in circulation [is] adequately controlled by the ordinary processes of competitive banking, and if the requirement of convertibility was maintained, could not exceed the needs of business for any appreciable length of time" (Viner 1937, p. 223). Banks are therefore purely passive instruments, expanding and contracting the supply of credit to meet the "needs of business." In other words, banks could not excessively issue credit no matter how hard they tried, because any excess funds loaned out would simply be returned to the bank. As Mises and others pointed out, however, the demand for credit on the part of business is not independent of bank policy, but relies heavily upon it, especially through the interest rate. The money rate of interest can be reduced below the natural rate, thus artificially increasing the demand for credit. There is therefore no restriction on the extension of credit of the sort imagined by the Banking School. Following the passage of Peel's Act, the Bank of England, although abiding by the new restrictions on note issue, began a large-scale expansion of its deposit-banking activities. This credit expansion fueled a speculative bubble that caused a drain on the specie reserves of the bank, and resulted in severe panics in 1847. Eventually, the 100-percent reserve provision of Peel's Act was suspended so as to prop up the central bank and its subsidiaries, thus negating the whole point of having the restriction to begin with. "As Mises and others pointed out, however, the demand for credit on the part of business is not independent of bank policy, but relies heavily upon it, especially through the interest rate." Although their system was faulty (except regarding the error of the Currency School), the Banking School consequently triumphed in terms of influence. The Banking attack on the mistakes of the Currency School, coupled with the failure of Peel's Act to prevent financial crises, falsely legitimized many of the Banking School's doctrines. Economists such as Tooke and Fullarton provided much of the theory of money and banking that was adopted and developed by economists such as John Stuart Mill, Karl Marx, Rudolf Hilferding, and possibly even John Maynard Keynes. Thus its influence was felt in many economic traditions, while the Currency School's influence was relatively benign. Although the Currency School enjoyed the de jure success, de facto victory went to the Banking School. In the eyes of the public and of many economists, it appeared that governance by the Currency principle had been disastrous, and therefore limitations on the central bank had proven, at best, unimportant for mitigating crises, and, at worst, a serious obstacle to sound banking practices. Even though Peel's Act remained nominally in effect until the First World War (and exists in highly amended form even to this day), it was repeatedly suspended during periods of crisis, and any claims the Currency School made regarding the elimination of crises were largely discredited in the public eye. The Currency School's efforts were redeemed, however, when Mises published The Theory of Money and Credit in 1912. Here, Mises systematically corrected the Currency School's errors and expanded their theories, producing the consistent explanation of the business cycle that the Currency School lacked. For example, Mises noted that the Banking School had been correct in one regard: bank notes and demand deposits do perform the same economic function and thus should receive the same treatment from the perspective of monetary policy. By this time, however, monetary theory had begun to move in a different direction. The theories of economists such as Irving Fisher and John Maynard Keynes were on the rise in the early decades of the 20th century, and the older theories — and just as importantly, the questions they sought to answer — fell out of fashion. With the rise of Keynesian and Monetarist economics and their many variations, many of the problems that vexed the Currency School were assumed away. Instead of investigating the ability of banks to expand the supply of credit and the effects of such expansion, the idea of a central bank carefully steering the economy via monetary policy began to be taken as a matter of course. The valuable opportunity that was presented by the Currency-Banking dispute, the possibility for systematic monetary reform, was largely wasted. The failure of the Currency School highlights the importance of basing economic policy and reform on sound economic theory. Theoretical errors that might appear minor in certain contexts can exercise an enormous impact on monetary history. In our own lifetime though, events have presented us with a severe financial crisis, and for the first time in decades, popular concern is growing regarding the rationale of the current system, and the conventional wisdom on the subject of money and banking is being challenged. Let us hope that today we have learned enough from past errors to correctly approach monetary reform, and that we have the intellectual fortitude to pursue it, so that future generations will not look at this period of history as merely another wasted opportunity for necessary, radical change. We might divide the different camps of the dispute further, for example, into the Currency, Banking, and Free-Banking Schools (White 1984), or, following Smith (1990), into four groups: Currency School, pro- and anti- central bank, and Banking School, pro- and anti- central bank. These further distinctions, however, do not play a vital role in our discussion. The actual provision of Peel's Act stated that notes could be issued to a ceiling of £14,000,000, beyond which it was only allowed to issue notes on a 100-percent specie reserve basis. Daugherty, Marion R. 1942. "The Currency-Banking Controversy, Part I." Southern Economic Journal 9 (2): 140–55. Schumpeter, Joseph A. 1963. The History of Economic Analysis. New York: Oxford University Press. Smith, Vera C. 1990. The Rationale of Central Banking and the Free Banking Alternative. Indianapolis: Liberty Press. Viner, Jacob. 1937. Studies in the Theory of International Trade. New York: Harper and Brothers Publishers. White, Lawrence H. 1984. Free Banking in Britain: Theory, Experience, and Debate, 1800-1845. New York: Cambridge University Press. Wu, Chi-Yuen. 1939. An Outline of International Price Theories. Reprint, Auburn, Alabama: Ludwig von Mises Institute, 2007.